The best value in limit straps. UPC:800199931204 Rod End Thread Size:3/4-16 RH in. Rod End Head Bore Size:0.750 in. Rod End Head Diameter:1.750 in. Rod End Head Width:0.687 in. 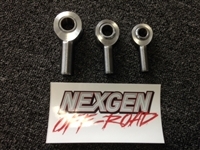 Rod End Centerline Length:2.875 in. Rod End Ball Width:0.875 in. Rod End Static Load Capacity:23,192 lbs. FK KMX Series rod ends are constructed with a heat-treated and hard chrome plated alloy steel body with a 52100 steel hard chrome plated ball. These 2-piece, injected nylon-style rod ends feature a race made of nylon 10 or an equivalent. All of our limit straps are quad wrapped 10,000lb webbing. Every PRP limit strap is sewn 4 layers thick and is strongest available on the market. 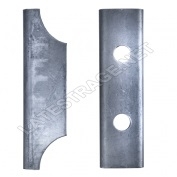 Available in 1" increments from 6" to 38" to fit your specific application.